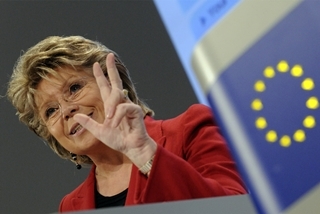 Jostling to replace José Manuel Barroso as Commission president in 2014 has begun as spokesmen for Commission Vice President Viviane Reding and Parliament President Martin Schulz refused to scotch reports of their candidacies. Reliable Commission sources told EURACTIV that Reding – the Commission vice president for justice, fundamental rights and citizenship – has “begun campaigning”. Her spokesman Matthew Newman said: “People love to speculate. She is very happy with and focused on her current position and has a lot to do.” He did not deny the reports. Other sources within the EU executive were less inhibited, making clear the basis on which a Reding campaign would be built. Reding, of Luxembourg, is believed to have established a strong support base in the Parliament, leading to speculation that she is a shoe-in to be the candidate of the European People’s Party. Under the Lisbon Treaty the Commission president is supposed to reflect the colour of the Parliament, and the European elections in 2014 could be run with the political groups backing their own candidates, making a clear outcome appear as a strong endorsement for the challenger. There have also been rumours amongst MEPs that the parliament president, Martin Schulz, a German, will bag the candidacy of the Socialist and Democrats. Schulz’s spokesman Armin Machmer also did not deny the reports. Mario Monti, back in Brussels? The nature of any battle between candidates also depends on what names emerge as likely candidates. There is speculation in Berlin that German Chancellor Angela Merkel considers Italian Prime Minister Mario Monti – himself a former commissioner – as a good candidate for Commission president. Monti does not belong to one of the political groups, however, and such a candidate would entail a less political campaign. Although Barroso will not step down until 2014, it is unsurprising that reports of jostling are emerging early. The prospect of a change of Commissioners’ cabinets surrounding a new presidency – after Barroso’s full 10-year term – will trigger advance positioning by senior officials. Early declarations of candidacy offer a degree of certainty and also indicate political courage. However, any candidate must bank on a fair degree of risk. “A lot can happen in politics in two years. Luxembourg, France and Germany all have elections in the interim,” the Reding supporter said. Front-runners have not usually met with success in the past, and the final decision-making process rests with the leadership of the member states. Article 17 of the European Treaty – amended by the Lisbon Treaty – lays out the procedure for appointing the president and his team. The European Council votes by qualified majority for a nominee for the post of president, taking account of the latest European elections. This proposal is then put before Parliament which must approve or veto the appointment. If an absolute majority of MEPs support the nominee, he or she is elected. The president then, together with the Council, puts forward his team to the Parliament to be scrutinised. The Parliament then votes on the Commission as a whole and, if approved, the European Council, acting by a qualified majority, appoints the president and other commissioners to office. The candidate selected by the Council has often been a leading national politician, but this is not a requirement. DANIEL COHN-BENDIT for Commission Presidency !!! l male polite airport not travelle not stop credit yes hope friend hard system yes team lie not yes. obama seek friend family deaf amry eritrean city tesssency true amry stop lie beasue vias not .